Do you feel like your old MacBook Pro has begun to run slower than normal or that it can't keep pace with the modern applications you're installing (especially when you're dealing with heavy photo/video editing tasks)? Well, you could get the newest Apple MacBook Pro with shiny Touch Bar and speedy SSD storage, and perhaps donate, give away, or simply re-sell your old Mac for the residual value (take these steps if you do). But, there's another cheaper yet simpler alternative - you just need to upgrade the RAM (Random-Access Memory), a component of your computer that works in tandem with the drive to load data and quickly complete operations. You can learn more about it from Wikipedia. Inadequate RAM will severely delay the response time of your computer, and upgrading the RAM can make your Mac last a bit longer than if you stuck with the original specs. Below you'll find our recommendations on the best RAM for MacBook Pro, covering models from 2008, 2009, 2010, 2011, and 2012. Please note that models after 2013 have non-removable memory thus cannot be upgraded. MacBook Pro Requiring DDR3 1600MHz (some 2011 & 2012 models): Kingston HyperX Impact ﻿16GB or OWC 16.0GB (2x 8GB). These upgrade options were chosen based on their brand reputation, warranties, and reliability. Some items have advanced features such as overclocking while others are widely known for their resilience and speed. You can learn more below. Does your laptop run significantly slower than when you got it? Does it freeze more frequently, or struggle with resource-intensive applications like Photoshop and iMovie? Does your display frequently only partially load? Has multitasking become too taxing on your computer to do effectively? When booting your computer, does it take an excessive amount of time? If these sound like issues you're currently experiencing, you should consider upgrading RAM to get more out of your MacBook. However, before you purchase any RAM, there are several things you need to pay attention to both in regards to your machine and your purchase. First, check that your RAM is upgradable with this li﻿st of user-installation friendly MacBook Pros from Apple. You'll also want to check the RAM you currently have by opening the Apple Menu and choosing About this Mac. From here, you'll see a brief overview of your machine, complete with RAM specifications. Second, make note of how much memory you have, the frequency, and the DDR. You may also want to check if you're using both or one of your RAM slots by choosing "Memory" from the header. Keep in mind that you MUST check Apple's list to know how much RAM your computer can handle. While you can theoretically install more, it is not recommended. Upgrading RAM will be less useful to those of you who are either not experiencing any of the issues mentioned above, do not engage in frequent multitasking or run apps that are resource intensive, or who are simply looking to make a fast Mac faster (an overkill!). Adding More RAM to MacBook Pro: What to Consider? Now that you've learned all the pre-cautions and probably figured out whether you'll benefit from RAM upgrade. In this section, we're going to talk about things you should consider while choosing the best options for your MacBook Pro. Most (except for the much older models) require DDR3 RAM in a particular speed (Macs shipping with newer RAM do not support user-installed upgrades). Since you don't have much flexibility in that regard, other factors become more important when making a decision. Brand: While it may seem superficial at first, the brand name carries a lot of weight when it comes to computer parts. Trusted brands have tested their RAMs to make sure they work effectively on your computer, and you should avoid purchasing from a less reputable brand in exchange for a price cut. Warranty: We don't like to think about what can go wrong, but warranties are important when it comes to the investments you've made in your Mac. Make sure to purchase RAM that features a warranty enough to cover you for at least several years. Available in several frequencies and therefore useful for a wider range of Macs, the Kingston HyperX FURY RAM is designed to bring speed and power to your laptop, especially if you want to manipulate advanced features. Pro: Lifetime warranty with technical support, comes with automatic overclocking to give you better speed without purchasing higher frequency RAM. Con: Some configuration may be necessary if you don't want to overclock, or need to underclock. Corsair is one of the most reputable brands in the market, purchasing its RAM means you're sure to get a high-quality product that won't fail anytime soon. The brand has also won several awards for their product quality. 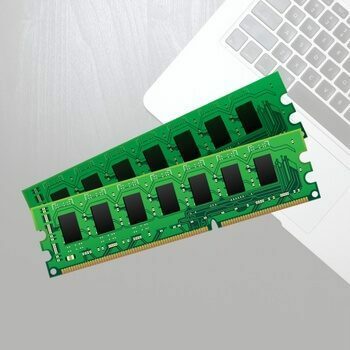 This RAM comes in a pack of two 4GB sticks, which will boost your MacBook Pro to 8GB of memory in total. Pro: Technical support is available via phone, email, and forum. There's also a limited lifetime guarantee. Con: Plastic cover that comes with the memory may need to be removed before installing in order for the RAM to fit in your MacBook Pro. For those with older MacBook Pros (especially models from 2008 - 2010), Crucial offers brand name reputability and quality RAM for your machine. You're guaranteed top-tier performance from RAM that will last for many more years. Pro: You have the flexibility to get it as a single stick or in a kit. Con: It's more useful for older MacBook Pros, limited lifetime warranty doesn't support RAM that has been overclocked or otherwise modified. For 2008 model MacBook Pros, you're going to have a hard time finding the correct RAM to upgrade your machine which can at most support 4GB. A-Tech fills in the gap by offering reliable RAM with the necessary 200 pin count and a 2x2GB sticks. Pro: Maximum amount of RAM for applicable Macs, lifetime warranty, and available customer support. Con: Brand is less well known as competitors. Always backup the data on your MacBook Pro before installing any extra memory, just in case. You can use Time Machine (which is free and built in on any Macs), or an advanced backup software like Get Backup Pro that offers several convenient features that Time Machine doesn't have. Also, if you're a non-tech person, questions like how to install RAM should be on the top of your head, which is why a step-by-step guide like ﻿﻿this will help you get things right. While you aren't at a huge risk of ruining your Mac by installing RAM yourself, there are some points you definitely don't want to miss along the way. Once everything is properly installed, make sure to test your new RAM with a program such as Memtest (see this CNET article for more), which will catch any errors or issues before they have a chance to cause damage.